On leaving school at 15, Edmund (Eddy) Birchall, like many young lads in the 1950s, went straight down the mines. Eddy comes from a long line of coal miners, having traced his family tree back to 1786 to discover that he is a seventh generation miner. After serving the whole of the First World War, his grandfather, was killed down a coal mine and he is buried in a Lancashire Cemetery. Edmund studied mining for a number of years, gaining the City and Guilds Silver Medal for Mining for 1967. He went on to become a Ventilation Officer at a number of collieries, before moving to the National Coal Board s Method Study Department. He left mining in 1970 and worked in local government for the next 30 years, becoming the Head of the Chief Executive s Health and Safety Unit in a large local authority. Edmund now lives in retirement on the beautiful island of Anglesey, with his wife Margaret. 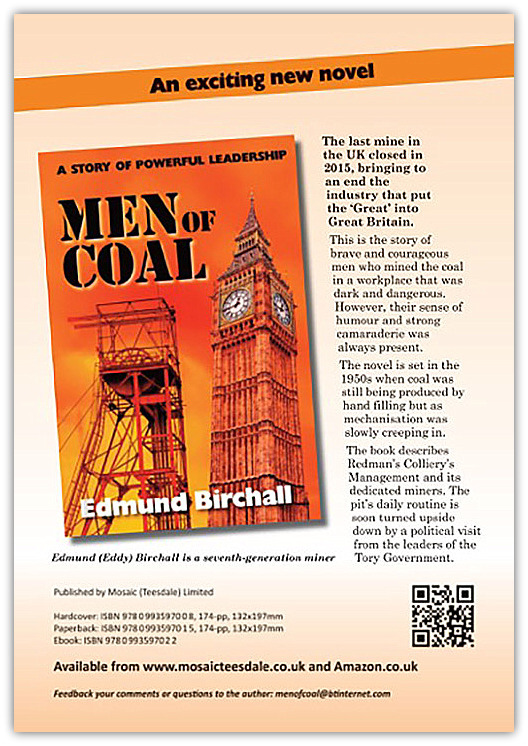 This semi-autobiographical novel is based upon Edmund s experiences working in mines in the Lancashire coal area in the 1950s. Edmund was one of the first students to gain a Bachelor of Arts with the Open University on its formation in the early 1970s. The last mine in the UK closed in 2015, bringing to an end the industry that put the ‘Great’ into Great Britain. This is the story of brave and courageous men who mined the coal in a workplace that was dark and dangerous. However, their sense of humour and strong camaraderie was always present. The novel is set in the 1950s when coal was still being produced by hand filling but as mechanisation was slowly creeping in. The book describes Redman’s Colliery’s Management and its dedicated miners. The pit’s daily routine is soon turned upside down by a political visit from the leaders of the Tory Government. Men of Coal is edited and published by Mosaic (Teesdale) Ltd. I am a little bewildered by the amount of information my American husband (we live in the USA) has sent me about mining in Nottinghamshire. His interest was sparked by reading that the last coal mines in England are closing. Good for the environment—but nevertheless the end of a brave and fascinating era! My maiden name was Diana Young, and my father was Eric Young and I grew up in Edwinstowe House. My father was managing director of the Bolsover Colliery Company till he was asked to join the National Coal Board in 1947. He agreed, much against his will. I remember Mr Atlee, (“that Socialist!”) having to come to dinner to persuade him! So then we had to move to Surrey. I’ve always been a writer, and have written about those years, (from my childish perspective) mostly because I wanted my wild and woolly surfing dude grandchildren who live in Hawaii to know a little about their past. Surprisingly, the book has been quite successful, particularly here in America, obsessed as they are with all things Brit. 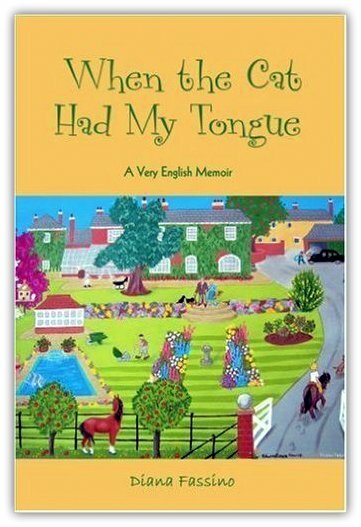 My married name is Fassino, and the book, ‘When the Cat Had My Tongue’, is available on Amazon, or in the Edwinstowe Library, if it might be of any historical interest to you. I came back to Edwinstowe, (and hardly recognized my old home! They gave us lunch and a tour—and presented me with a book about my father!) to do a reading at the library shortly after the book was published. Now—back to reading and finding out more. There is so much to learn, and aren’t we lucky it is all available to us at the click of a key in this astonishing modern world? Book Description iUniverse, United States, 2006. Paperback. Raised by nannies and governesses in an English country house where you practically needed a passport to travel from the nursery wing to the drawing room or the maids sitting room, the author portrays with uncritical candor and humour a vanished world of privilege and isolation. We meet an alarming grandmother with tomb breath and eyes flecked with blood and malice, witness the near execution of a village enemy, share the author's passion for animals, her suspicion that her flamboyant godfather may in fact be her father, suffer the torments of boarding school and of first love, and wonder with her on her wedding night if the Duke of Windsor could really have given up the throne of England for this. If nostalgia is your thing, you should read this unique, hilarious insight into the Upstairs Downstairs goings-on in Diana Fassino's riveting, intensely personal account of upper class English country life during WWII. John Whitney. Director Sagitta Productions. Creator of Upstairs Downstairs. Diana Fassino's endearing English wit enchanted me from cover to cover. Betsy Pearson, artist and syndicated columnist.